The metaphor inherent in the term family “tree” is apt in many ways – not least because some branches seem to bear more fruit than others – or at least more fruit that can be harvested. Such is the Wallace branch of my tree. Donald Wallace was my 3x great grandfather. He died at the age of 41, and so gets written out of the story quite quickly, but in trying to learn more about him, I have begun to uncover rich and complex stories about other members of his family. Indeed, I’ve spent so much time pursuing these, that Donald himself has been somewhat neglected. Like many (probably most) of my ancestors, Donald Wallace left little trace of himself in written records, although, having been born in 1830, the an outline of his life does appear in census and statutory birth, death and marriage records. Donald lawful son of James Wallace in Balnald and Ann Cunnison his wife born 13th and baptized 14th October 1830. 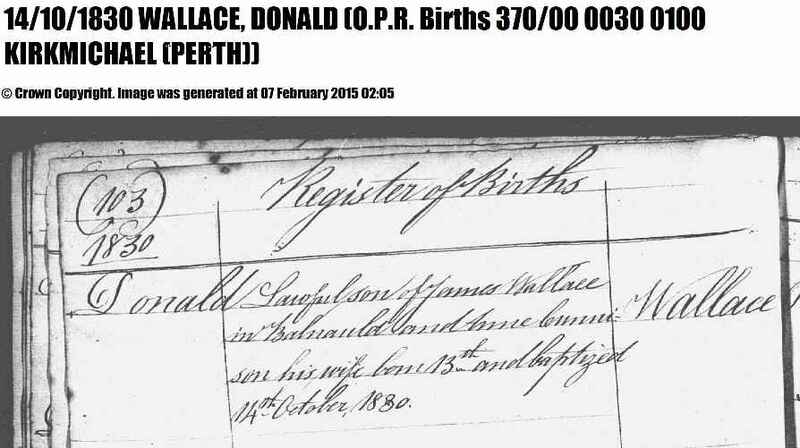 OPR birth record, Donald Wallace. Source: Scotland’s People. The same parish register records that James Wallace and Ann Cunnison married on 28 September 1828. Ann Cunnison had given birth to another child, Ann Symon, two years before her marriage to James. While birth record shows the father’s name as Charles Simon, there is no evidence he and Ann Cunnison were ever married. Ann Symon seems to have lived her early life in the Wallace household, and died quite tragically at the age of 58 – and event I’ve written about here. OPR records show that ten children were born to James Wallace and Ann Cunnison, all in the parish of Kirkmichael. These were Robert, born 1829; Donald, b. 1830; Spence, b. 1832, Elizabeth, b. 1835; Alexander, b. 1837; Thomas, b. 1839; Charles, b.1841; John, b. 1844; Margaret, b. 1845; Christian, b. 1848. The 1841 census shows Donald Wallace living at Balnald in Kirkmichael parish, with his parents and six of his siblings. This census contains a lot less information than those carried out later, but it does show that James Wallace was a shoemaker. While I haven’t been able to find a record for Donald in the 1851 census that I’m totally confident of, there is a Daniel Wallace, of the right age and birthplace, working on a farm in the parish of Kirkmichael. 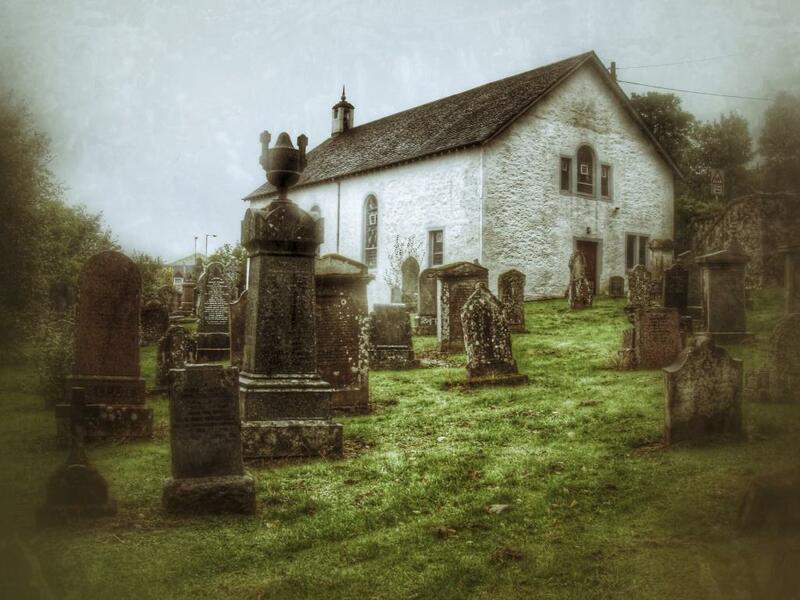 I’ve checked the OPR records for Kirkmichael for the period 1815-1840 (a huge window that would allow for age discrepancies on the census return), and there were no children named Daniel Wallace baptised in the parish during that time. Of course, this doesn’t guarantee that Daniel is actually, as not all children were christened and therefore entered in the OPR. However, given that Kirkmichael was a small rural parish with otherwise pretty comprehensive OPR records, I think it is ok to assume – until I learn otherwise – that it was Donald Wallace who worked as a farm labourer for tenant farmer John Fleming at Craig of Solaire, Kirkmichael. The 1861 census shows Donald Wallace living at Kinvaid Farm, in Moneydie, Perthshire. The household consisted of the tenant farmer – whose surname is unclear on the census but may be Line (or Lion)– his wife and two sons, plus seven servants; six men, including Donald, and Jean Morrison, whom Donald married later the same year. Donald is listed as a labourer, living in the bothy (1), while Jane is listed as domestic servant. Their marriage record, in the District of Dunkeld, Perthshire, shows the date of marriage as 13 December, 1861, at Dungarth. Donald was 28, and a labourer. His address is shown simply as Dunkeld (a small town in Perthshire). His parents were named as James Wallace and Ann Kinnison. Jane’s age was shown as 22 and her address as Dungarth. Her parents were listed as Peter Morrison and Betsey Philips – both deceased. I can’t find a place named Dungarth in Perthshire, so I’m thinking it may have been the name of a house – perhaps where Jane was employed. Dungarth is also shown as the address the marriage took place. The witnesses to the marriage were Andrew Kinnison and Margaret Rutherford. The latter name is totally unfamiliar to me, and while I don’t yet know who Andrew Kinnison was, I am working on the basis that he was a relation of Donald’s mother Ann – a brother or nephew perhaps? … so I’ll not retell her story here. The 1871 census was taken on 2 April. It shows the family’s address as Woodside, St Madoes Donald’s occupation was listed as farm labourer, and the household consisted of Donald, Jean and four children; Ann, Margaret, Isabella (my 2x great grandmother) and James. Neither Christian nor John appeared in the 1871 census because Christian was born later that year, in December; and John had died of bronchitis, aged five months, in February 1871. As a sad aside: James Wallace died of croup in February 1873, aged 3 ½. Both boys died in wintertime of respiratory illnesses – as did their father. The informant on the death record was Donald’s younger brother Charles Wallace, who gave his address as 62 Cross Lane, Dundee. Donald’s parents James Wallace and Ann Kinnison; were both still living at the time of their son’s death. 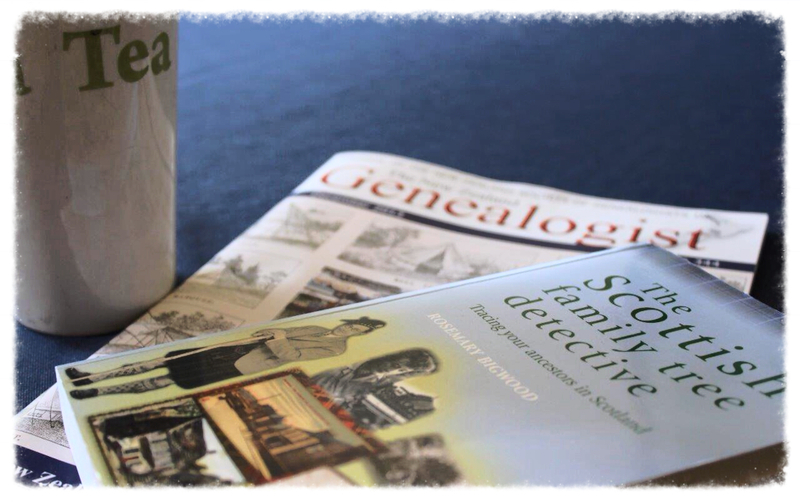 For me, family history research is about sharing stories. I’ve had this post about Donald Wallace sitting unfinished for a while because, while I have been able to research the skeleton of his life, I don’t feel that I have much of a story to tell about him. Here was a man who lived his life in a relatively small area; moving from place to place as his work took him. He and his family probably lived in housing provided by his employers, and his death left his widow and children not only without a breadwinner, but homeless as well. Barely a year after Donald’s death, Jean Morrison married again — to a widower named John Balsillie. Isabella Wallace Simpson, third daughter of Donald Wallace, seated far right. 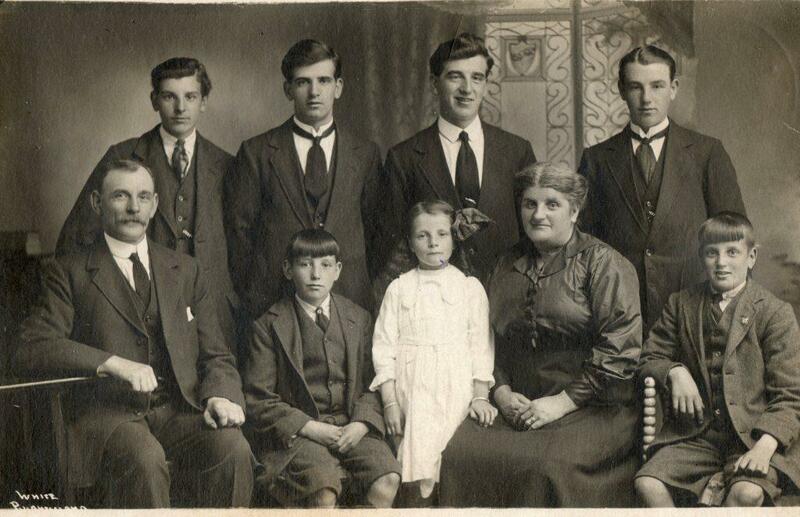 Next to her her grandaughter (my grandmother), Margaret Ramsay, Margaret’s son David Ramsay (the young boy), Isabella’s elder son Alexander Cruden (my great grandfather) and Alexander’s step grandmother, Elizabeth Reoch Brown. Photo: Cruden-Ramsay family archive. It’s tempting to say that Donald Wallace lived and died so long ago it’s hardly surprising that his story lacks detail and texture. 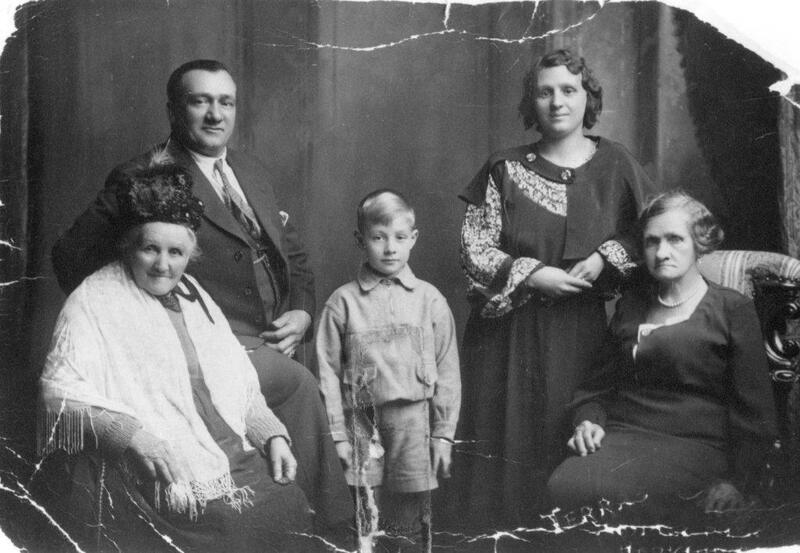 Yet his daughter Isabella, who was five when he died, lived until 1944, and was very much a part of my mother’s life. My mum has great knowledge of much of her family, but this Wallace branch seems sadly bare, and it’s unlikely that will ever change. 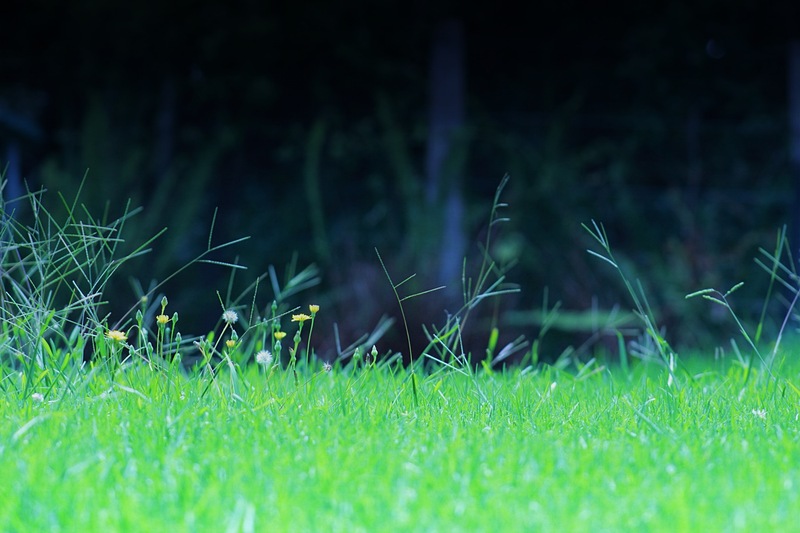 The lawn — no matter how overgrown and in need of mowing — can’t compete with a day spent looking for ancestors. Photo: Su Leslie, 2015. The dry spell finally broke and yesterday was wet and very windy. A perfect day to stay inside (sorry lawn-mower, our date is off) and work on the enormous pile of family history puzzles, brick walls and apparent dead ends. Jane Morrison, a 3x great grandmother, has been in my “more questions than answers” pile for too long, so seemed a good candidate for a bit more research. Jane Morrison belongs to my Cruden family. Alexander Cruden, my mother’s maternal grandfather, was Jane’s grandson – the eldest son of her daughter Isabella Wallace. I began my family history project by looking into the Cruden line, largely because my mother was very close to her granddad, and I really enjoy being able to share my findings with her. Writing about the family has also introduced me to new cousins on this side, and to reconnect with others I’ve been out of touch with for many years. Jane is a fascinating character; twice married, twice widowed. Mother of eleven children – two of whom died in early childhood. Born in Scotland, she emigrated to the United States in her sixties and died in Detroit. Her name has been carried down the generations in granddaughters and great granddaughters on both sides of the Atlantic. I know a lot about her life from 1861 – the year she married my 3x grandfather, Donald Wallace, through to 1901 – the last Scottish census in which she appears. I also have some records relating to her emigration to the United States, and recently found her death record. But Jane’s early life has consistently eluded me. And that’s the puzzle I set myself for the day. Death record for Jane Morrison, 1914. Jane Morrison’s 1861 marriage record shows her age as 22, and her parent’s as Peter Morrison and Betsy Philips (both deceased). As birth dates in old records are frequently unreliable (because people deliberately gave a different age, genuinely didn’t know, or through clerical errors), I cross-checked against census returns and the record of her second marriage, in 1875, to John Balsillie. At her second marriage, Jane gave her age as 30 – about six years younger than she would have been if the first marriage record was accurate. Given that Jane was a widow with four young children at the time of her second marriage, it wouldn’t be surprising if she shaved a few years off her age. Her first husband had been a farm labourer, and when he died in January 1872, Jane and the children lost not only a husband and father, but the tied cottage that was their home as well. Jane moved the family to Dundee (where census records show she had been born) sometime soon afterwards. I know the family was living in Dundee by February 1873 because Jane’s son James Wallace died then, and his death is recorded as occurring in Dundee. Subsequent records, including her death certificate in 1914, show fairly consistent “ageing” from what was recorded on her second marriage. What all of this means really, is that Jane Balsillie was probably born sometime between 1836 and 1846. In the past, I’ve searched without success in both FamilySearch and Scotland’s People for births of people named Jane Morrison. I’d tried broadening the time-span, searching the whole county of which Dundee is part, allowing broad variation in her surname (and searched on her mother’s maiden name). I even broadened the search to include all of Scotland, and strange as it may seem, I could not find a birth record for any child born in the right time period to Peter Morrison and Betsy/Elizabeth Philips/Morrison – let alone one called Jane. I tried removing the parents’ first names from the search and still had no real success. Ridiculously, I had never before checked the records of Catholic churches in Scotland. My family seems to have been staunch Presbyterians for so long that it simply hadn’t occurred to me that I might have Catholic ancestors (yes, the noise you hear is my palm slapping my forehead). You know where this is heading, right? I found a record in the Catholic Parish Registers for a child called Jane Morrison, born in 1842 to Michael Morrison and Elizabeth Philips. Jane appears to be the second child of this couple. They had a daughter, Catherine, born in Dundee in 1838, while in 1844 a third child, Patrick, was born, but this time in Perth. As this is the closest I have so far come to finding any likely candidates for Jane’s family, I decided to investigate a bit further. The 1841 census shows Michael, Elizabeth and Catharine Morrison living at Milnes East Wynd, Dundee, alongside 11 other people. I found this record on Scotland’s People, but also looked it up on the wonderful site FreeCen. While Scotland’s People provides original records, FreeCen is transcribed data – which is particularly useful when the handwriting on original documents is difficult to read. With FreeCen, it’s also possible to easily look at the records for adjacent properties. This gives both a flavour of the area and can often reveal extended families living close together. And of course, best of all, FreeCen is free. The property where Michael and Elizabeth were living seems to be adjacent to a jute mill, where Michael – a weaver – almost certainly worked. Jute weaving was one of the principal industries in Dundee during the period, which is why many Irish migrants arrived in the city. Both this record and those of adjacent households show a large proportion of residents born in Ireland – including Michael and Elizabeth. Morrison family, 1841 census. Screenshot from the wonderful FreeCen site. Sadly, here the trail goes cold. I cannot find Michael Morrison, Elizabeth/Betsy Morrison/Philips, Catherine, Jane or Patrick Morrison in the 1951 census. In the 1861 census I can only find Jane, and she was living in a farm household in rural Perthshire, working as a servant. Her soon-to-be husband, Donald Wallace is also listed in that household as a farm servant – so I guess I know how they met! I have found a death record for a man called Michael Morrison in 1851. The record shows him as a weaver, born in Sligo, Ireland and his place of death is shown as Millars Pend, Scouring Burn – virtually the same address as that shown for the Morrison family in the 1841 census. While these suggest it might be the same Michael Morrison shown in the 1841 census, the age of the dead man is given as 51 – a discrepancy of 10 years, and the burial record is in a Presbyterian OPR – not a Catholic one. I’ve gone around in circles with this one and I think it is yet another mystery that I’ll have to park until more records come online, or I find someone else who is approaching the problem from a different angle who might have information I don’t. Frustrating yes; but a lot more fun than mowing the lawn. I can’t believe it’s almost a month since I did any real family history research, but I guess that is how it goes. The elusive Jane Morrison has been much on my mind, and conscious that I’d hit a brick wall at the beginning of her life I decided to take another look at the end. The last record I had for Jane was the 1901 census, which showed her living at 2 Lawrence Street, Dundee with four adult daughters: Bessie aged 26, a jute weaver; Bella, 25, (actual name Helen, not my 2x great grandmother Isabella) a confectioner; Mary, 20, a jute weaver; Henrietta, 18, also a confectioner; and two boarders – Peter Young, 22, a telegrapher; and Andrew Balsillie, 22, a railway worker. Jane’s age was given as 57, and her marital status as ‘widow’. I haven’t been able to find Jane in the 1911 census, nor have I found a death record in Scotland for her. Because Scottish statutory marriage records usually show parents’ names and whether they were alive at the time of the marriage, I thought I’d look for Jane’s children’s marriages and see if there were any clues there. I was tempted to just look for the younger daughters’ marriages; those I knew were single in 1901. But in an attempt to be more thorough, I decided to work systematically through all of Jane’s off-spring who survived to adulthood – those she bore to my 3x great grandfather Donald Wallace and the five children of her second marriage to John Balsillie. The first child to marry was Jane and Donald Wallace’s second daughter, Margaret. Margaret Morrison (b. 20 June 1864) married James Campbell Bennett a journeyman engine fitter of Harmony Row, Govan, on 31 December 1883. Margaret was 19 and a yarn winder. Her older sister Ann was a witness to the marriage. 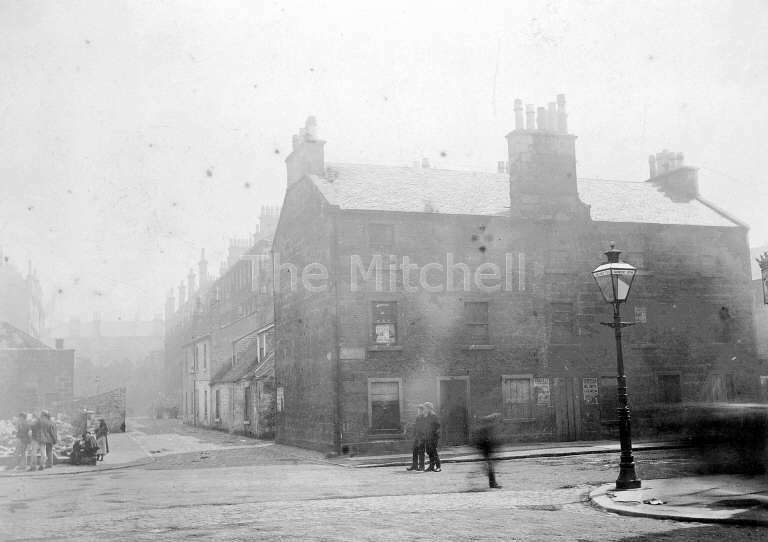 Harmony Row, Govan. Photo: Mitchell Library. These days Harmony Row is known for the local football club — the place Sir Alex Ferguson got his start! The second marriage was that of my 2x great grandparents; Isabella Simpson Wallace (b. 2 May 1866) and Stewart Cameron Cruden, on 31 December 1886 at 5 Stewart Street Dundee (the bride’s address). The groom, aged 23 was a Draper’s Collector; Isabella was 20 and a jute weaver. Next to marry was Ann Morrison (b. 4 September 1862) – Jane and Donald’s eldest child. Her marriage record shows that on 3 January 1888, at the age of 25, she wed Matthew Kelly aged 33, a factory carter of Lawrence Street, Dundee. Ann’s address on the record was Stewart Street, Dundee. 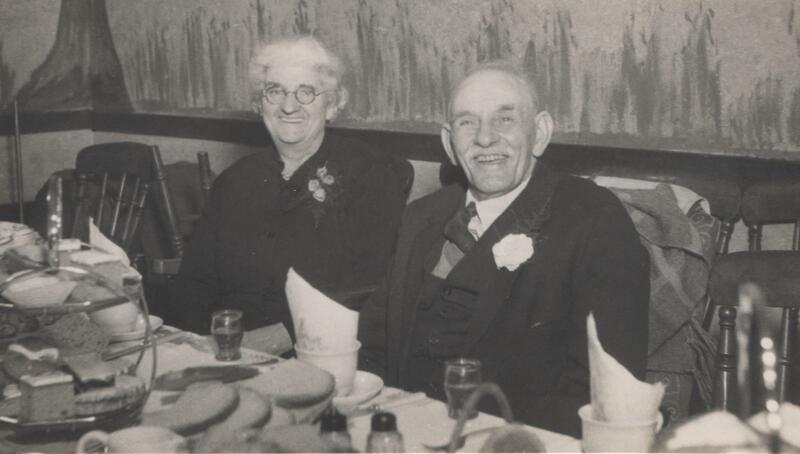 The marriage was witnessed by Ann’s younger sister Christina Wallace and someone called George Watson. 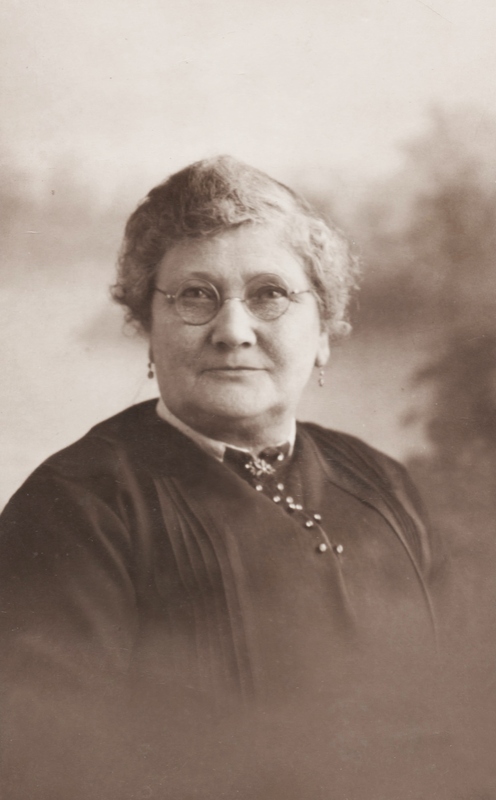 On December 28 1893, Christina Wallace (b. 23 December 1871) married James Ramsay at Logie Hall, Scott Street, Dundee. James was aged 30 and a farmyard skinner of 114 Lochie Rd, Dundee. Christina was 22, and an Assistant Housekeeper of 5 Stewart St, Dundee. Christina’s stepsister Helen Balsillie was a witness, as was William Ramsay. Mary Jane Bett Balsillie (b. 30 October 1877) married Peter K Young, 25 July 1902 at 25 Milnbank Road, Dundee. He was 23 and a lithographer/printer. She was 24 and a jute weaver. The witnesses were Nellie (Helen) Balsillie and David Young. Peter Young was of course, one of the boarders recorded as living in the Balsillie household on the 1901 census. Henrietta Balsillie (b. 28 April 1882) married William Aird on 9 November 1904 at 25 Milnbank Road, Dundee. Both were 22. William was an electrician and Henrietta a confectioner. Bessie Balsillie was one of the witnesses. 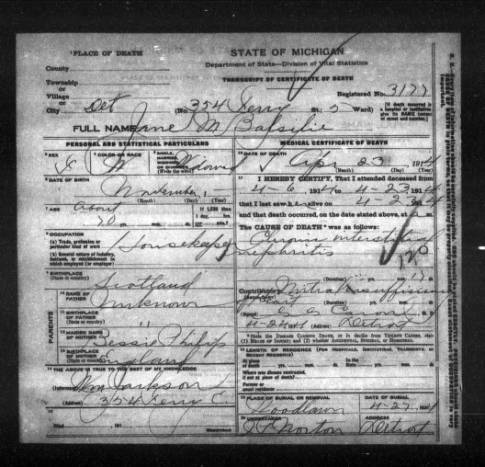 Jane Morrison was shown on the marriage record as being alive at the time. That leaves Betsy Esplin Balsillie (b. 15 April 1874), Helen Walker Balsillie (b. 25 January 1876) and John Balsillie (b. 18 October 1879) for whom I have not found Scottish marriage records. A descendent of Henrietta Balsillie and William Aird got in touch recently and sent me his family tree details. This showed that Henrietta and William’s third child, Mina, was born on 29 November 1907 in Detroit, Wayne County, Michigan, USA. Given that I hadn’t found a Scottish death record for Jane Morrison, I had been wondering if she might have left Scotland. My family (particularly the maternal side, which includes the Cruden branch) seems to have quite a history of migration, so I was quite confident that I would pick up Jane’s trail somewhere outside of Scotland. 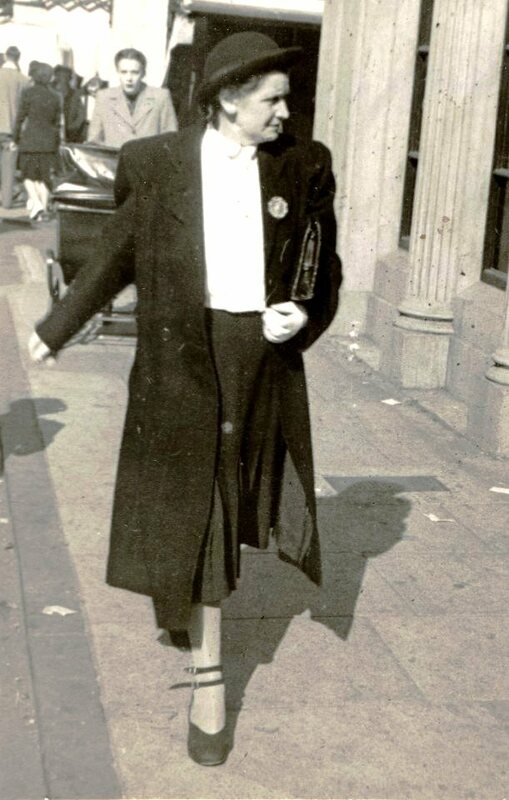 The evidence that at least one of her daughters had immigrated by 1907 led me to look for Jane in the United States. On Ancestry.com, I found a Mrs Jane Balsillie aged 62, travelling to New York as a second class passenger aboard the Columbia in April 1906. With here were three younger women also called Balsillie: Bessie aged 28; Nellie, aged 21; and Jane aged 18. Given that I hadn’t found marriage records for Betsy (Bessie) or Helen (Nellie) Balsillie in Scotland, I assumed that Jane was travelling with her daughters – although Betsy would actually have been 32 and Helen 30. The younger Jane is a mystery though. 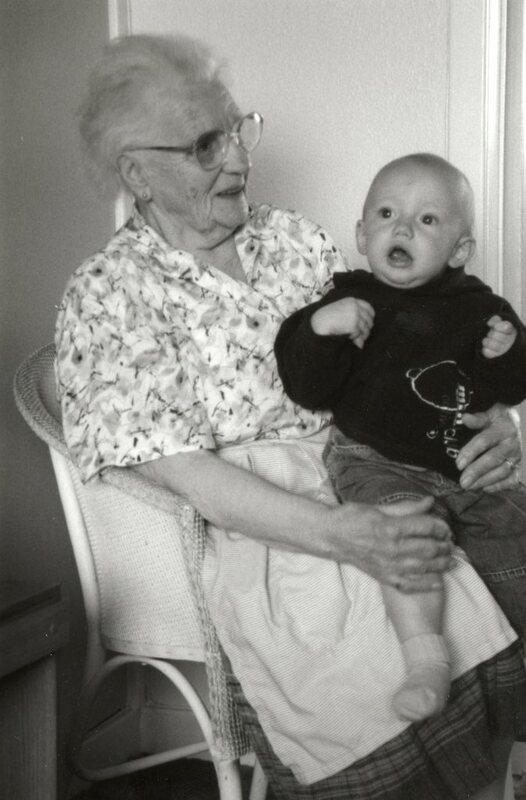 Aged 18 in 1906 means she would have been born around 1888. I have found no record of Jane Morrison bearing any children after Henrietta in 1882, and no child called Jane Balsillie appears in the 1891 or 1901 census returns. I am wondering if this person was Mary Jane Bett Balsillie, but as she had married Peter Young in 1902, and would have been aged about 28 in 1906 – perhaps not. I decided to put that mystery aside and see if I could find other evidence that might suggest I had the correct Jane Morrison – and what happened to her. I found a second travel record for Jane Balsllie – this time returning alone to the UK in June 1908 aboard the Furnessia. I also found a third record for travel back to the US in April 1909, aboard the Lusitania. This final record was the New York, Passenger Arrival Lists (Ellis Island) for 23 April, 1909. Jane’s age was given as 65 and her Scottish place of residence as Dundee. I’m not sure how confident I can be of these records. In the 1906 passenger manifest, three out of four of the names “fit” although the ages aren’t quite right. The 1908 passenger manifest contains very little information, beyond the name, age and nationality, while in the final record the age and place of residence in Scotland match. I doubt there is any way of knowing for sure if these records relate to my relatives. However, as Jane Morrison/Balsillie, Helen Balsillie and Betsy Balsillie all disappear from Scottish records after Henrietta’s marriage in 1904, and I need a working hypothesis to move forward; I have chosen to proceed on the basis that the travel records I found are for my relatives and that after 1906, I should look for these women in the United States. 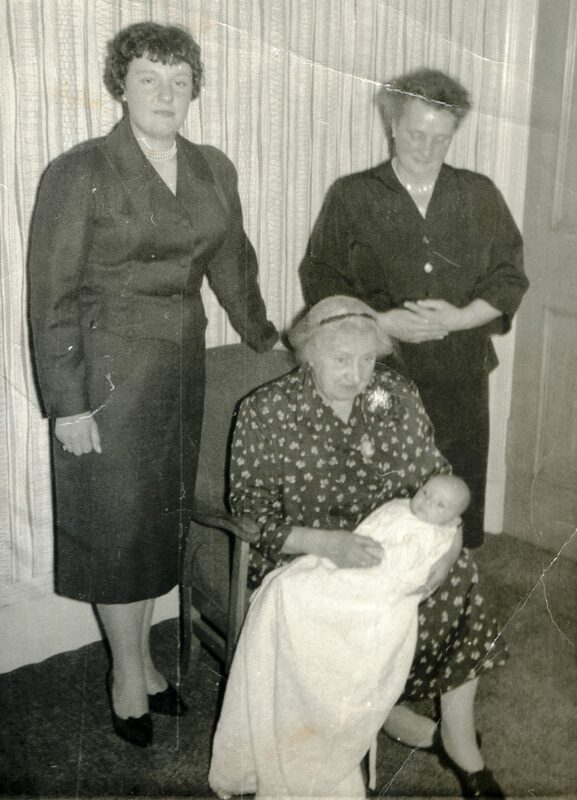 Because I knew Henrietta’s child Mina was born in Detroit, I assumed that Jane and her unmarried daughters followed Henrietta and her husband to the United States. However, travel records for the Airds show that they arrived at Ellis Island in May 1907, a year after Jane’s first entry to the US. 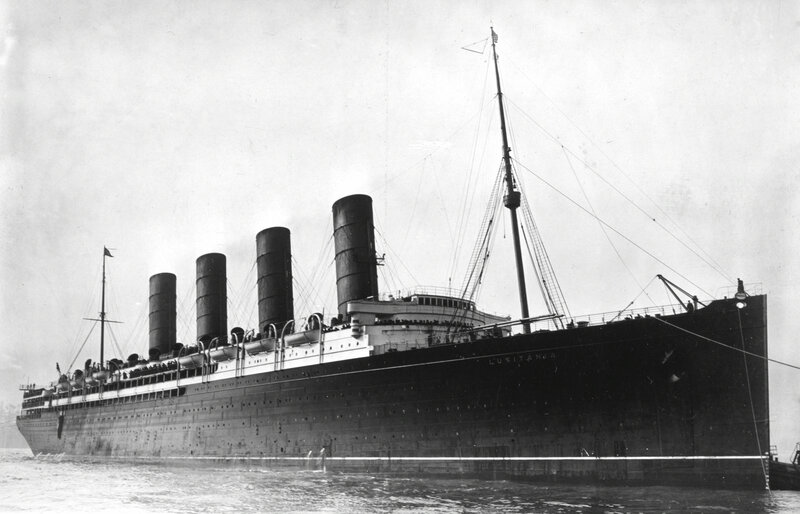 I am much more confident of the Aird travel records because they show Henrietta (a fairly uncommon name), William and two children arriving on the 13 May 1907 aboard the Caledonia. The children’s ages and names (Jeannie M. and William L.R.) 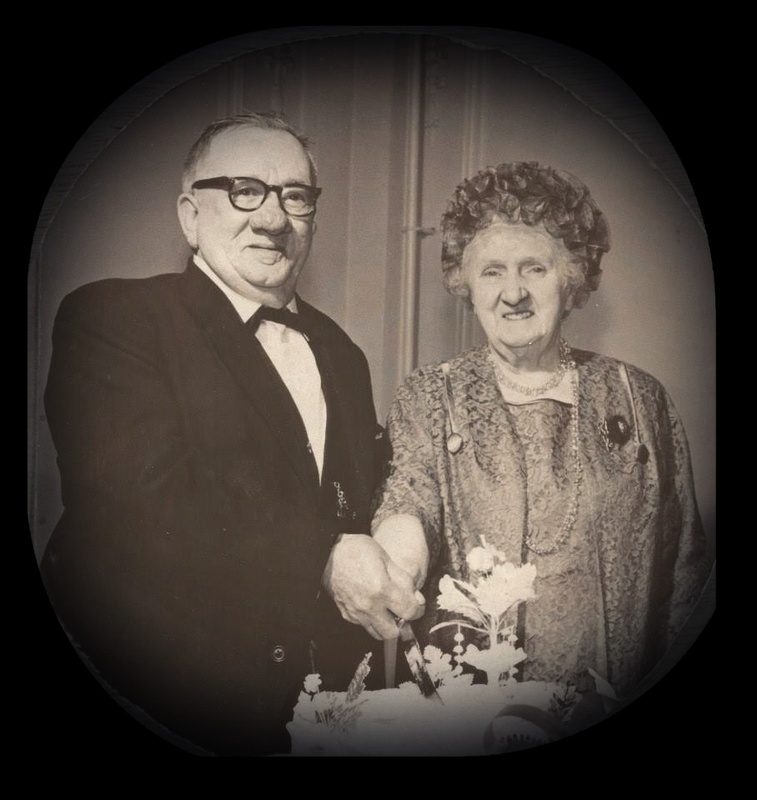 match the Aird family tree I’d been given – William Lawrence Robertson Aird was born in 1905 and Jean Morrison Aird in 1906. What happened in their lives? What happened to John Balsillie jr? Who is mysterious younger Jane who travelled to the US in 1906? Is it Mary Jane Bett Balsillie? Was she widowed? Did she leave her husband? Did any of Jane’s older children from her marriage to Donald Wallace also emigrate? I know that Isabella and her husband Stewart Cruden lived in New Jersey during the 1920s-30s. What about the others? A few days ago I got a message from a very distant relative by marriage. It seems that this man’s great uncle was married to Henrietta Balsillie, the half-sister of my 2x great grandmother, Isabella Wallace. Isabella and Henrietta were both children of Jane Morrison. Jane Morrison has, to date, been a shadowy figure in my family tree. I know she married my 3x great grandfather Donald Wallace in 1861, had five children and was widowed in 1872. She married John Balsillie in 1873 and went on to have another five children – Henrietta being the youngest. L-R: unknown, but probably Elizabeth Cruden (nee Brown), Alexander Cruden, David Ramsay, Margaret Ramsay (nee Cruden), Isabella Cruden (nee Wallace). My correspondent asked me about the photo above which I’ve written about here – speculating about the identity of an old lady in the picture. Jane Morrison was one of the possible candidates. My conclusion was that the old lady in my photo WASN’T Jane, but only on the basis of the plausibility of one family story over another. I didn’t have any real evidence. So, feeling rather pleased with myself recently for finding a research technique that seems to work for me and produce good results (see recent posts about the Ramsay family), I decided to don metaphorical Inverness cape and Deerstalker hat and throw myself, Sherlock-like, into the life of Jane Morrison. One of the best lessons I’ve learned recently is to start at the end – with the most recent information available. For Scottish records (and all my ancestors are Scots), this means birth records that are at least 100 years old, marriage records 75+ years old, and death records that are 50+ years old. Jane Morrison married in 1861 and gave her age on the record as 22. That means her death record should be available (assuming she died in Scotland). However, despite trying various spellings of Balsillie; wildcard searches, and using her maiden and first married names to search on, I haven’t been able to find a death record for Jane Morrison / Wallace / Balsillie. This could mean she died outside of Scotland, changed her surname (perhaps a third marriage), or that the person indexing the records transcribed her name in such a way that the Scotland’s People algorithm doesn’t recognise it as being a possible match for Balsillie. Also in the household were two boarders, Peter Young, 22, a telegrapher; and Andrew Balsillie, 22, a railway worker. In 1871 Jane Morrison was living with her first husband, Donald Wallace at Woodside, St. Madoes, a village in Perthshire. The couple had four children, Ann, aged 8; Margaret, 6; Isabella, 4; and James, 2. A fifth; Christina was born on December 23 1871. Donald Wallace died on January 23 1872, aged 40. He was a farm servant, and his death record gives the place of death as Castle Huntly, Longforgan – about 10 miles from St. Maddoes. Castle Huntly is now a prison, but in the nineteenth century, the area was part of an estate owned by the Patterson family. It is likely that the Wallace family would have been living in a cottage tied to Donald’s job, and if so, his death left Jane and her five children – including one month old Christina – not only without a husband, father and breadwinner, but also without a home. I know that Jane Morrison married John Balsillie on 21 March, 1873 in Dundee – fourteen months after the death of her first husband. John was 49 and a widower. Suspecting that Jane would have become homeless (and almost certainly penniless) after Donald’s death, I wasn’t surprised she remarried so quickly. What I did wonder was why she had moved her family to Dundee. 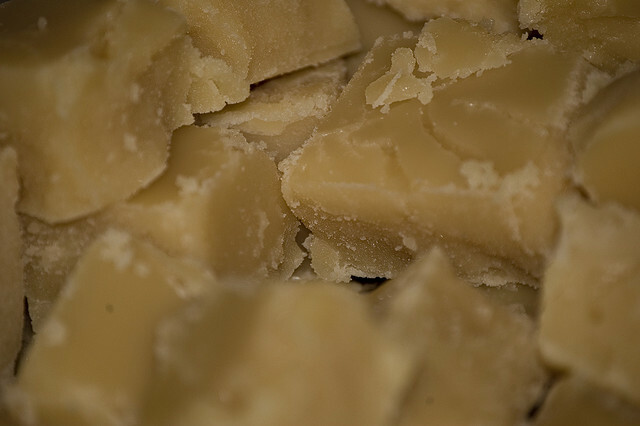 In the nineteenth century, Dundee was one of the most important industrial centres in Scotland. 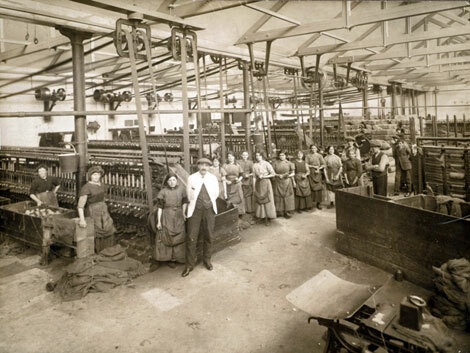 The textile industry was central to the city, with both linen and jute weaving. It seemed possible that Jane moved there after her husband’s death in order to look for work (for herself and her older daughters) in the jute mills. Checking the census records, I also found that Jane had been born in Dundee, so even more likely, she was returning to a place where she may have had family members who could help support her, if not financially, at least emotionally. Jane’s marriage records gave her parents’ names as Peter Morrison and Betsy Philips. Peter’s occupation was shown as ‘weaver’, and both parents were deceased at the time of her first marriage in 1861. Whether she had siblings, and other family members in Dundee, I didn’t know. I searched Scotland’s People for a birth record for Jane Morrison. When she married Donald Wallace, her age was given as 22 which would have meant she was born around 1839-40. The ages she gave on later census returns would have put her birth around 1844, so I searched the records for the years 1835-1845. I also searched the whole county of which Dundee is part, and allowed for quite broad variation in her surname (even searching on her mother’s maiden name) – but with no success, so I broadened the search to include all of Scotland. Strange as it may seem, I have yet to find a birth record for a child born in the right time period to Peter Morrison and Betsy/Elizabeth Philips/Morrison – let alone one called Jane. Returning to census records, I found that in 1861 Jane was living as a domestic servant for the Lion family in Moneydie, Perthshire. Her place of birth is (as on other census returns) shown as Dundee. 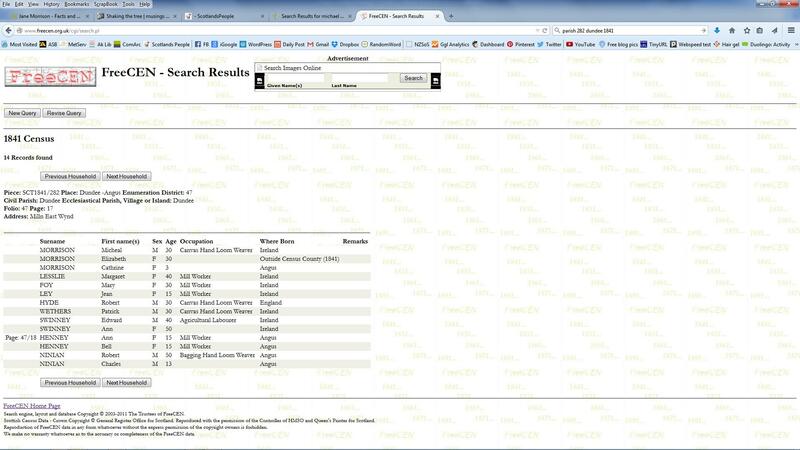 Donald Wallace is also listed on the same census record as a ploughman at the Lion farm. Jane’s age was given then as 20; Donald’s as 28. Moneydie is a village in Perthshire; about 30 miles from Dundee, and also about 30 miles from Donald’s birthplace of Kirkmichael, Perth. I’ve tried to find Jane in the 1951 census, but this is proving difficult because I don’t know where she might have been living. If she was around 20 in 1861, it is reasonable to assume she was a child in 1851 and living with family. However, I have found no records for a family comprising Peter Morrison, Betsy Philips and Jane Morrison – or even one of the parents and Jane. It is of course possible that Jane’s parents died before 1851 and she was living elsewhere, but with the information I currently have, there is no way to really know that. I could search death records for people called Peter Morrison and Betsy Philips/Morrison, but according to Scotland’s People, there are 19 OPR (Old Parish Register) death records for men called Peter Morrison (exact spelling) between 1835 (my earliest guesstimate of Jane’s birth) and 1854 (when statutory records were introduced); plus a further 34 Peter Morrisons in the statutory records for 1855-1861 (when Jane married). On the other hand, for the same period, there are no OPR (Old Parish Register) death records for women called Betsy Philips, but five for women called Elizabeth Philips, 43 for Elizabeth or Betsy Morrison and 106 statutory records for Elizabeths and Betsys Morrisons or Philips. And that’s without allowing for any misspelling or variation on the names. With so many possible matches, I’d need to spend a fortune on Scotland’s People credits even trying to identify my ancestors. So I am left knowing only a little more about Jane Morrison than I did at the beginning. My next step is to follow the trail of her children to see if this can shed any light or provide clues. One of the first things I noticed looking at the 1871 and 1881 census records was that James Wallace, age 2 in 1871 did not appear on the 1881 census alongside his sisters. James Wallace died in Dundee on 5 February 1873 – barely a year after his father’s death. He was aged 4 years one month. The cause of death was croup – a respiratory infection. I began this post by describing Jane Morrison as a shadowy figure, and I end it feeling much the same. I don’t know when or where she was born, or when and where she died. I do know that she was orphaned before she married – possibly when she was still a child. She buried a husband and son within 13 months, during which time she also probably became homeless and moved with her children to Dundee. She married an older man, bore another five children and was widowed for a second time in her 50s. To us, living in the early 21st century, remarrying so soon after a spouse’s death may seem somewhat heartless, but for Jane Morrison, there may have been few other choices. I wonder then if her second marriage was a happy one? Was John Balsillie a good step-father to her children? Did the couple care for, and perhaps love one another? I can never know these things. 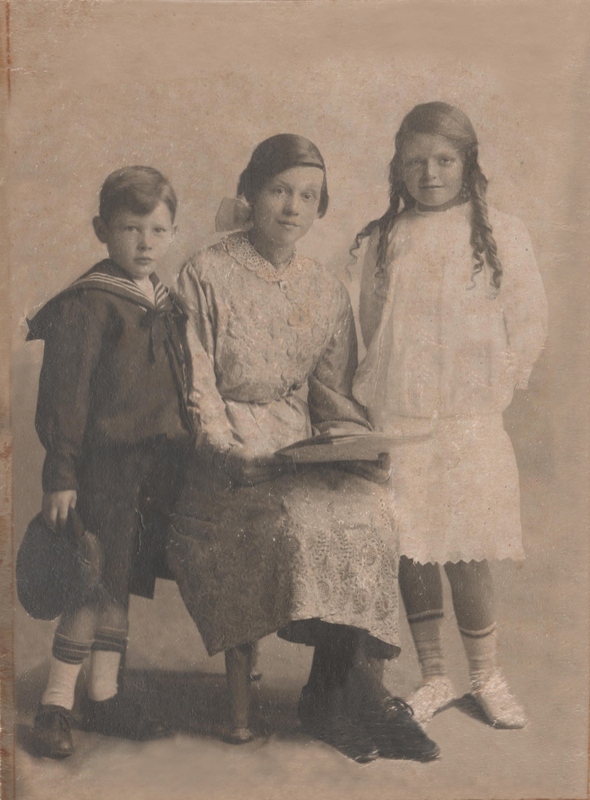 I do however know that my 2x great grandmother Isabella Wallace – who was seven when her mother married John Balsillie – gave two of her daughters Balsillie as a middle name. Whether that was a mark of some respect for her step-father I don’t know, but I’d like to think so.